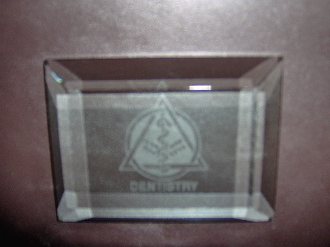 This is an elegant crystal paperweight with the dental caduceus; the medical caduceus can also be engraved. It comes in a gift box and measures 4" by 3" and is 3/4" in thickness; the sides have very nice bevels. Please allow three weeks for delivery. Max of 15 characters.